This frozen cocktail is about to become your new favourite summer beverage. A delicious blend of tropical flavours, it's perfect for serving at your next pool party or backyard BBQ. Add all ingredients to blender and blend until smooth. 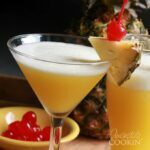 Pour into glasses and garnish with pineapple and cherry. This recipe for Rum Cruiser Cocktail was printed from AmandasCookin.com - https://amandascookin.com/rum-cruiser-cocktail/ and can only be printed for education or personal use.